It is Michelle lee Skaletski-Boyd, the Corporate Woo-Woo™, and I am so glad you are here. As a Soul Journey Guide and Intuitive Medium I have had loving divine messages channeling through me ever since I was just a little girl. Below is a free gift just for you and 4 popular gems for you to enjoy ! “This best-selling book is my gift to all who strive to move beyond the boundaries of the material world and fully connect with God and the universe. (God is Source, Creator, Universal Intelligence, All That Ever Is & Ever Was. )” ~ Author, Michelle lee Skaletski-Boyd, Intuitive, Speaker, and Clinical Transpersonal Hypnotherapist. 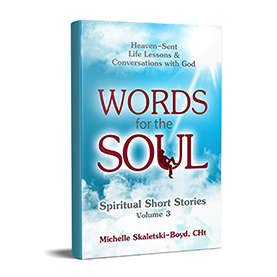 Perfect for those who are walking the path of spiritual awakening, this Words for the Soul: Heaven-Sent Life Lessons & Conversations with God, Volume 1 came to be after spiritual seekers throughout the world began requesting each short story about the author’s personal experiences about Self-awareness be captured in book form. Each powerful heaven-sent lesson is written in such a way that you can add joy to your journey on your path of spiritual awakening. From learning to laugh at your little self as it grows and connects to your Higher Self, to pulling back the curtain on your limiting beliefs, this book deepens your understanding of Self-discovery as you become more uplifted and entertained. After receiving numerous notes and thanks from readers who were moved by our first powerful collection, this second album was born. Amazon best-seller, Words for the Soul: Heaven-Sent Life Lessons & Conversations with God, Volume 2 is the second creation in the Soul-Felt Sequel™ containing several more spiritual short stories that are sure to uplift and inspire. The Corporate Woo-Woo™ Michelle lee Skaletski-Boyd left her job in the corporate world believing the “net would appear” when she took a leap of faith to follow the path of her soul. Struggle, failure, hardship, and fears were just some of the tragedies her spirit encountered. 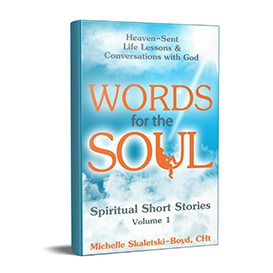 Throughout her soul-felt journey Michelle not only resisted her own inner power, often battling hard with her ego, she began following her intuition and recorded each experience in depth, including her conversations with God. Volume 2 spirituality categories include: CHILD’s PLAY, CHANGE & TRANSFORMATION, PROJECTION AND SELF REFLECTION and MOVING THROUGH FEARS to name just a few. To get the most from every spiritual story take some time to go within, then select the one life lesson your soul most needs to raise your energetic frequency. 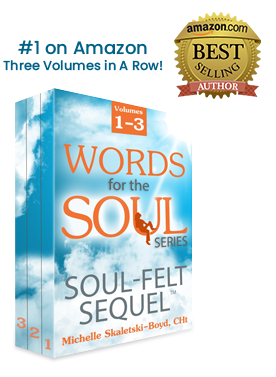 This volume 3, Amazon Best-Seller, Words for the Soul: Heaven-Sent Life Lessons & Conversations with God is third in the sequel, following BEST SELLERS volumes 1 and 2. It contains spiritual stories so uplifting your entire world just may shift. Every volume has been designed so you can read any story from any book in any order and at any time and still receive all of the subconscious benefits. — The question is, are you ready for it? The Corporate Woo-Woo™ Michelle lee Skaletski-Boyd resigned from a long standing corporate career believing the “net would appear” when she took a leap of faith to follow the path of her soul. Struggle, failure, hardship, and fears were just some of the tragedies her spirit encountered. Throughout her soul-felt journey Michelle not only resisted her own inner power, often battling hard with her ego, she began recording each experience in a journal, including her conversations with God.These profound spiritual short stories include detailed life accounts to help move you through your fears, make peace with your inner doubts, and overcome self-defeating patterns and limiting beliefs. Spirituality categories include: PLAY & CELEBRATION, RESISTING THE OBVIOUS, and GLIMPSES OF HEAVEN to name just a few. To get the most from every spiritual story take some time to go within, and then select the one life lesson your soul most needs at this time so you can be more empowered and raise your energetic frequency. Stuck in a cycle of suffering and retaliation, Misty and Vann Waters are on the brink of divorce. 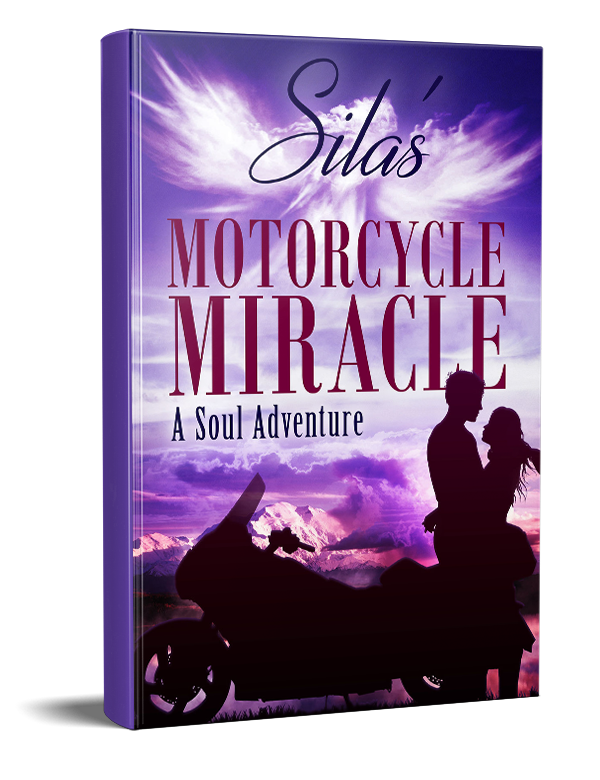 Looking for a miracle, they ride their Goldwing to Alaska and meet a telepathic biker named Silas who takes them on wild adventure through drama, the afterlife, and the dream world. This novel was 10 years in the making for author Michelle lee Skaletski-Boyd. Based on real life experiences and powerful teachings it is designed to uplift your energy so you may Enjoy the Experience™ wherever you are in the world.